We are not computers. We are not machines. We do not think procedurally. That’s why the “old way” of teaching math may not be the best way. The traditional way involves rote memorization and algorithms performed on paper. They require little to no understanding of why the algorithm works. It simply works. In some situations this is great. If I were to program a computer, I would use algorithms and procedural instructions because that is how a computer thinks. It’s not how humans think though. We have an advantage that computers don’t. We think strategically. We optimize for the easiest solution. We’re adaptive. We can think about a problem forwards, backwards, in chunks, from the middle out. We can rearrange terms, regroup, combine and split it apart. We can round up and down, and back again. We find patterns and draw connections. Even in mathematics, we are creative beings. If Algorithms Work, Why Shouldn’t We Primarily Teach Them? We forget. All the time. Especially when we don’t understand why the algorithm works or if it has been a long time since we last used it. The #1 complaint about math is: When will I use this in REAL LIFE? There are plenty of opportunities to perform basic math every day, yet most people resort to a calculator or simply give up. Algorithms are not convenient for real life, even if you remember them. They are difficult to do mentally. They aren’t intuitive. And often we don’t have a pencil, paper and the time necessary to do long-hand math. Why is Common Core Math Hated by Parents? Because the Common Core Math standards are trying to teach number sense and mental math techniques through various forms of diagrams and step-wise procedures that are new and look confusing. The truth about mental math is that what can be done simply in our minds doesn’t always look simple on paper. That is the point of mental math. It isn’t a system that looks nice and tidy written down. It’s a series of techniques combined with an understanding of the rules of mathematics which can be utilized in various ways. Which works just fine if I have a couple minutes and a pencil and paper. Truth is in real life, I usually don’t. Simple question, right? But I never had paper to write on and my phone was in my purse in the office. I was left with only my brain to solve it. I could try the algorithm in my head, but that wasn’t very effective. I’d forget the numbers as I added them and make errors. It turns out the simple algorithm above wasn’t so handy in real life. So instead I would start playing with the numbers. Now I’ll just add the hundreds together and tack on a five at the end. There we go! Add 5 and my answer is 1405. It took a few seconds, but was still quicker and more effective than going inside for a calculator or paper. And I got the right answer! And my boss was impressed! Double win. Unfortunately, this process isn’t easy to teach because it is mental math. It isn’t designed to be written down. It isn’t neat and tidy. It’s robust and practical. To further complicate things, it isn’t the only way of solving the problem. It is just the way that seemed easiest to me at the time. Number sense allows us to have an arsenal of ways to problem solve, including but not limited to the traditional algorithm. For example, take this story about the famous mathematician Friedrich Gauss. In elementary school, little Friedrich was very good at math, and he often finished his assignments quickly. As a result, he’d get bored and disrupt the other students. So one day to keep him busy, his teacher asked him to sum all the whole numbers from 1 to 100. If he were doing this the traditional way, as the teacher expected, he would add each number to the previous making a running total. As you realize, this process is tedious and time consuming. But Gauss didn’t think about numbers algorithmically. Instead he thought about them as components of a system. To his teacher’s dismay, he solved the problem mentally in a few minutes! He began by imagining all the numbers in front of him in a long line. As he thought about the numbers he discovered a useful grouping technique. 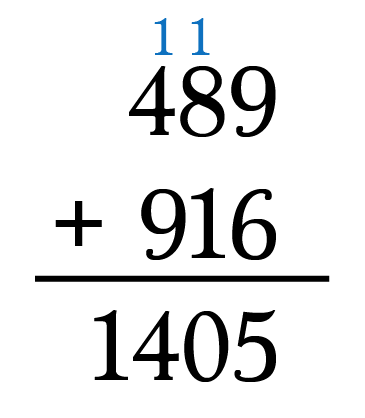 If he paired the very first number with the very last and continued this process inward, he noticed every pair summed to 101. In total, he had 50 pairs of 101. So the answer is 50 times 101. Note: We can complete this multiplication mentally by splitting 101 into 100 + 1 and multiplying the 50 through to obtain 5050. This beautiful display of numeric intuition, creativity and ingenuity is taught as the following formula in second year algebra classes, often without a mention of little Friedrich Gauss. But I never forget this formula. Not because I memorized it, but because I remember the story of its origins. You see (a-1 + a-n) represent the sum of the first and last terms of the sequence, 1 + 100 in our story. And n represents the number of terms in the sequence, which we divide by 2 to obtain the number of pairs. Finally, we multiply them together to yield the total. The point is we need stories, illustrations, and context to give the formulas and algorithms meaning. We desperately need to understand the foundations of our knowledge. Otherwise math becomes meaningless and forgettable. Befriend math! Be open to new perspectives and ask questions. The Common Core math standards are an attempt to expose your child to this flexible way of thinking. It may not be perfect, but it is in the right direction. If you are a parent finding it difficult to help your child with Common Core Math or if you are interested in learning math from a new perspective, please follow my publication Math Memoirs. If you are interested in learning mental math methods look for the lessons subtitled Mental Math Series.